For those new to the blog, I'm spacing out my 100 Things so as not to overwhelm myself or you. Please visit the 100 Things category if you'd like to go back to #1. Welcome to the Mr. Frick edition of 100 Things. Make yourself cozy. Cozy like you were wearing a spankin'-new Seamless Hybrid. Yeah, baby. 32. When Mr. Frick decided to ask me to marry him, he first went to my father. My father (typical) poured a whiskey. Mr. Frick does not like hard liquor. I like to think of this as the first of his Twelve Labors. He proposed in West Virginia after telling me he had a surprise I couldn't have unless I beat him in a Scrabble match. Like Brer Rabbit and the briar patch, that one. 33. Mr. Frick and I share the same favorite movie, which fact we discovered on our first date. Later, when we took a vacation in the SouthWest, we amused ourselves by yodelling raucously every time we crossed the Arizona border. 34. When I met Mr. Frick, I was dating one of his housemates. Said fellow was leaving for a Peace Corps tour in Madagascar in a week. Said fellow actually, no kidding, asked Mr. Frick to "look out for" me while he was gone. A-hem. 35. If you asked Mr. Frick, he would tell you that "our song" is They Might Be Giants' "She's an Angel." (Blush.) Being the geek I am, I love that our song has such a sweetly self-conscious narrator, contains the word "nonchalant," and that the Shriners show up. During our rehearsal dinner, the Shriners did actually race up and down the street outside of the restaurant. It was some firemen's parade, but that doesn't stop me from taking it as a sign. 36. Mr. Frick is a terrible judge of handknits, which I love. I made him a totally unsuccessful hat out of orange Peace Fleece once. It was gigantic. I felted it, and it was still gigantic. He loved it and wore it all the time. Even to bed. 37. Mr. Frick is magnetic. People just want to be with him. Once we went to Haiti and he managed to befriend every child in the village where we stayed as we built desks for a new school. He taught them some English and they taught him some Creole. This became a problem for me as, after one particular lesson, every teenaged boy in town was running after me and pointing and shouting, "That's my wife!" 38. Mr. Frick was a high school wrestler with the nickname "Mad Dog." I'm just going to let that one lie. 39. 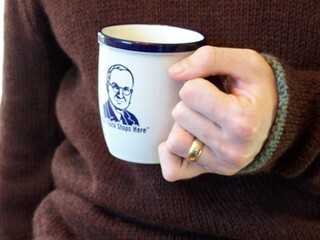 Mr. Frick is insufferable when he's had late-day tea. 40. When I first met Mr. Frick, he lived in a house (alternately called The Crack House, The Big Top, and That Dump on 13th) with a gaggle of other sweet boys. I fancied myself a bit of a Wendy in those days, though the truth of the matter is that I was just as lost as they were. Recent events have thrown us all together again, and though times are difficult and heartbreaking, I feel blessed to be surrounded by them. I have a bit of a crush on each and every one of them and so, with the SH leftovers, I'm working on a few little projects for these other loves of my life. 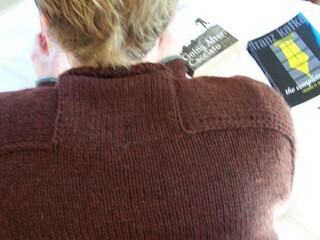 For those interested in particulars on the sweater, check out my post on the Zimmermania blog here. And sorry about the slightly grainy photos. Low camera battery, no patience. It sounds as though you are a lucky girl. I wonder what he would have done if you had had a run of bad luck with the Scrabble tiles? Not to say that he would have wandered off, just what challenge would he have thrown out there for you to beat him at. Oh, that dad and boy picture.... heart-melting. beautiful sweater. wonderful family. dad and son photos are the best. My son has slippers jsut like those, in blue. What a great frickin' post. Seriously. Mr. Frick sounds like a keeper, and that sweater is absoluetly fabulous. yay. love the mr. frick edition. and how clever to just "slip in" an FO post too. 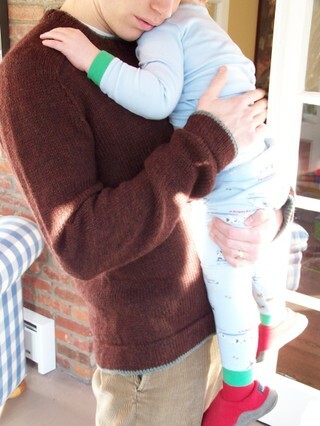 the sweater is wonderful and a classic one he'll wear for a long, long time. The slipper picture is precious. 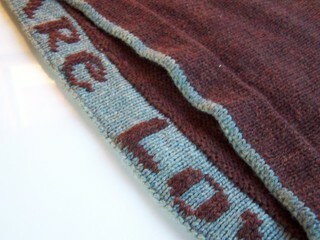 Thanks for the link to the lettering site,someday I'll knit Mr. Knitsox an SH. Mr. Fricks Seamless Hybrid looks fantastic on him! He sounds like a wonderful man. Julie that sweater is lovely! 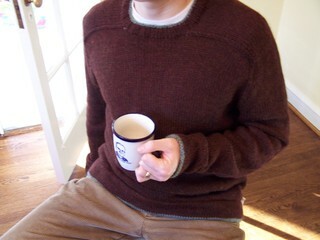 I just finished my husband's first sweater, swearing to never knit him another (he's a bit tall), but this post may have won me over. What book is this pattern found in?? I say submit yourself to Yarnival. You win again for FO posts. Great sweater and great post. I love this post! Thanks for sharing some personal moments with Mr. Frick. The sweater is awesome, BTW. Which EZ book has that pattern? The sweater is GREAT! Love the writing, love the colors, LOVE that bit behind the neck. Mr. HelloYarn and I very much agree with your taste in movies. I love that sweater! Thanks for the chart page too, I'm going to have to steal your idea for my hubby's seamless hybrid! What a fantastic SH for Mr. Frick, and as usual, an excellent post to boot. Glad to hear you, Mr F. and the gang are keeping your heads above water. Hang in there. This is such an original storytelling twist on the standard "100 Things" meme. And the photos are just perfect! the inscription is such a clever idea too! a beautiful sweater to match a beautiful post, juliæ! Love your blog, really I do! My parents also got together because Friend A was joining the service and asked Friend B (my dad)to watch out for his girl (my mom) - guess it always goes the same way! Love this post! 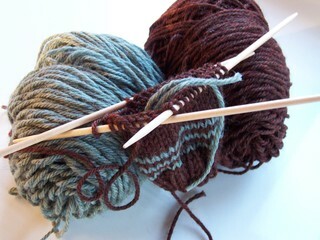 It makes me not want to run away from my family to an island with UPS service from Knit Picks. Mr. Frick is one lucky man! I read this post 5 times - truly beautiful. I hope you're working on the next '100 Things' instalment.